How Long are Leftovers Good? Wondering how long leftovers stay good? We’ve got the details! Buffalo Chicken Puff Pastry Pizza is the epitome of easy dinner. Grab a rotisserie chicken on your way home from work, you're gonna need it! 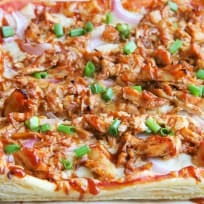 Puff Pastry BBQ Chicken Pizza will make parents and kids happy! It's an easy weeknight dinner that everyone will love. Using up your leftover rotisserie chicken has never been easier than this Instant Pot Gluten Free Chicken Noodle Soup! 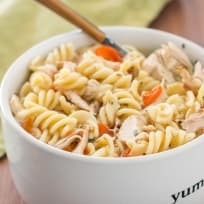 Good chicken noodle soup doesn’t have to be an all-day affair, put it on your dinner table in less than an hour. 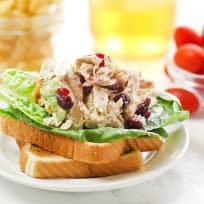 Lighter chicken salad has all the flavor with none of the guilt! Enjoy it as a summer dinner that requires NO cooking! Lemon Artichoke Chicken Tortellini Soup is perfect for warming up on this chilly fall day. With hearty cheese and spinach tortellini, it’s just right for your lunch. Coronation chicken is fit for a queen. No really – it was created just for Queen Elizabeth! Quick white bean chicken chili comes together in just 20 quick minutes. This is the sort of quick and easy dinner you need in your back pocket for any weeknight! This Chicken Caesar bruschetta is perfect for appetizers, snacks, or even a light dinner! Grab a glass of wine and you’re good to go. Paleo chicken salad is full of the good stuff - two kinds of grapes, pecans, homemade mayo and Dijon mustard. Lunch never looked so good. Rotisserie chicken avocado burritos are made with a store-bought rotisserie chicken, so you can make this easy meal in minutes. Definitely a winner, winner, chicken dinner for the whole family!